Ok, prepare yourself for some Serious Cuteness! 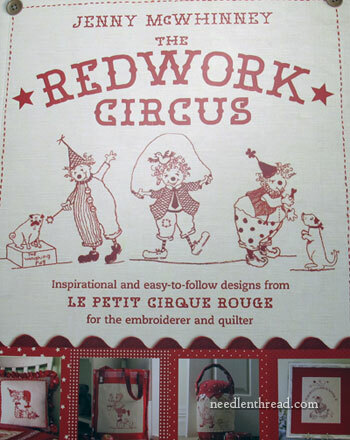 Jenny McWhinney’s new book, The Redwork Circus, is just exactly that – seriously cute! I should start with a little caveat: I do not, as a rule, like clowns. I have a huge aversion to them, like some people have an aversion to snakes or spiders or slippery eels. Clowns in parades, clowns in children’s books, clowns in movies (whether creepy or not), me as a clown on Halloween as a kid … I just have never liked clowns. 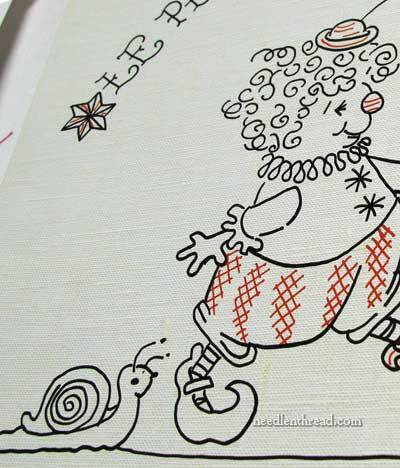 But when I saw The Redwork Circus sneaking out onto the market, I discovered clowns that I actually do like. This book is adorable. Redwork is a style of surface embroidery wherein the stitching (mostly very simple surface embroidery stitches) is all done in red thread. Redwork has a classic, vintage feel to it, and Jenny McWhinney has caught that feeling – along with a good dose of whimsey – in her new book, The Redwork Circus. Redwork is often seen in conjunction with quilting. The book focuses on some quilting-related projects, but many of the projects in it (there are 9 projects altogether) are not necessarily quilting, per se. They certainly have all the charm associated with quilting, though. The projects include a nine block quilt (kind of the “feature” project in the book), along with a cushion, a library bag, a doorstop, place mats, and so on. 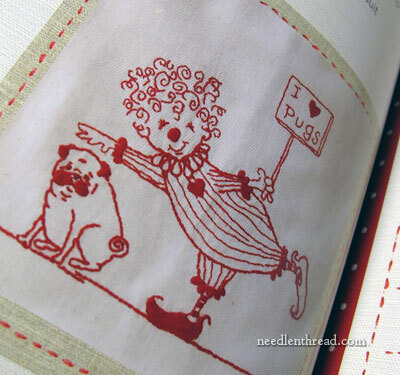 Each project includes, of course, a redwork embroidery focal point, featuring charming little clowns and their quirky playmates. … to useful fabric talk. 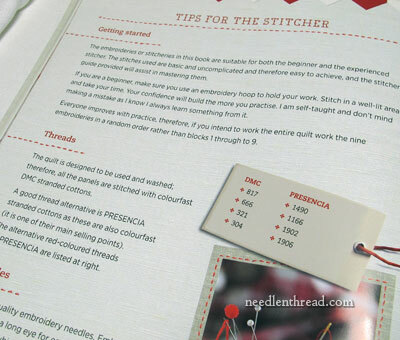 In fact, reading the section on fabric is helpful, whether you’re going to stitch the projects in the book or use the designs for your own projects. 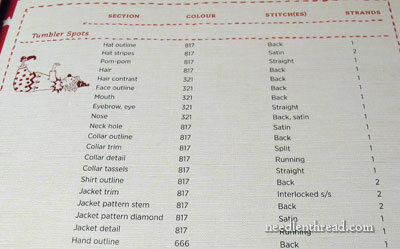 Jenny covers lots of good information on choosing fabrics for redwork projects. 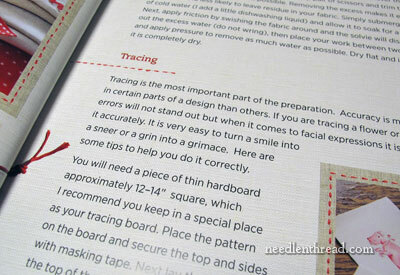 Other tips at the beginning include needful information on tracing patterns and transferring designs. Each project in the book has its own little section, covering the project from start to finish. Included are all the instructions for stitching the redwork designs, as well as thorough instruction on creating the finished product. I’m not exactly a quilter myself – and I only just sew (the straight seam is my friend – anything else, I view with trepidation). But when I went through the projects and read the instructions, I felt that even I could tackle the finish work on them. They are not super complex sewing projects, but they are clever finishes for showing off the darling designs offered in the book. Most of the instruction (including the stitching instruction) is presented in water color drawings, rather than in photos. The drawings and diagrams are clear, so although you might not see a step-by-step unfolding of every aspect of each project, you are given plenty to work with to ensure your successful completion of the projects, both in the text and through the visual aids. Another point about the drawings throughout the book – they contribute to the magic of the book. The whole book is a delightful work of art! 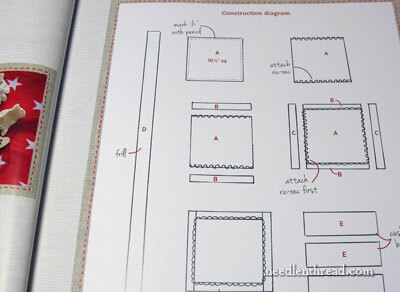 The fabric layout, cutting instructions, and assembly instructions are all given for each project. 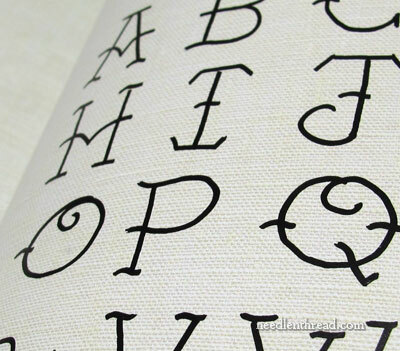 And each project includes a stitch guide that breaks down every part of the embroidered design, with the appropriate color number, number of strands required, and the stitch type. But really, the most captivating part of The Redwork Circus is the redwork circus itself! These happy little clowns – they have a frolicking, funny friendliness about them – and their playmates (dogs of various sorts and other little critters) are what make the book. Every time I look through the book, I find myself smiling. I want to stitch all of these little fellows and make other people happy, too! The patchwork quilt is the highlight of the book. This is where the redwork comes together in abundance. I suppose I’m a sucker for red (ok, I know I am!). I think this quilt is such a delight! It is cheery and cheeky and fun! 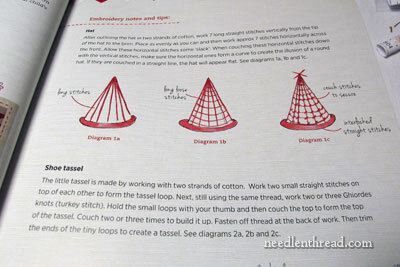 The back of the book contains all the cutting patterns for the various projects, and of course, all the embroidery patterns, which are presented in clear line drawings ready to trace. 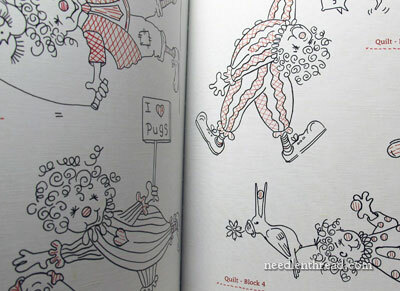 There are several pages of clowns and cohorts in the back of the book, and you can always combine the little guys and their friends to create your own little scene. The snail cracks me up! This is what I mean about whimsical – they’re all cute, they’re all humorous, but it takes that special little unexpected something to bring about the right touch of cheerful whimsy. And Jenny McWhinney always hits the mark with her clever artwork! 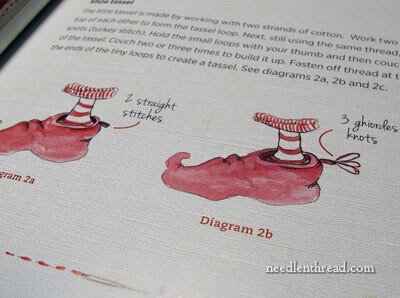 You’ll also find, in the back of the book, stitch diagrams for the recommended stitches. The nice thing about redwork is that the stitches are not complicated – it relies pretty much on the most basic embroidery stitches. The colors are limited, too (although Jenny does mix different degrees of red in each design), and this combination of basic stitches and limited colors for pleasing results makes redwork a very fun and relaxing style of embroidery. I do so want to make something out of this book! 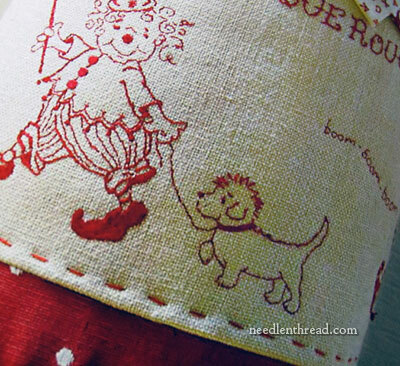 I can see a little clown scene worked out in red at the base of a winter white twill little girl’s jumper (as in dress), with jumbo red ric-rac peaking out below the hem… Hmmmmm…… the gears are turning! You can find The Redwork Circus on Jenny McWhinney’s website, which is located in Australia. No, I don’t like Pugs, but like your clowns, I love this one. So pleased to see inside this book. Not being able to have one to hand, I’ve been longing to see between the covers since it came out here. Jenny never disappoints. I love all her designs and work. Thanks muchly for the review. One of the pictures (the one with the shoe) has an arrow with the comment, “three ghiordes knots”. You have an excellent tutorial on this. Thanks so much for being such a great resource. I have a question? I come to needlenthread. Thank-you, thank-you. The clowns are less creepy because they are older style and not the bright orange hair, red nosed, balloon twisting, high pitched squealing, “IT” (movie) nightmares that show up at picnics. They are more like the friendly, old, quiet, great depression “hobo” style clown. The fact that they are children and not grown men is likely another reason that they seem less creepy. They are lovely little funnies. I am also okay with “jester” type clowns, who have the jester style costume, but agree that picnic style clowns need to stay at McDonalds. I don’t like clowns, including these clowns, but I will admit they are the least sinister I have seen… if I was going to stitch a clown it would be one of these ones. I can’t help wondering what that clown is REALLY going to do to the poor little pug, though. 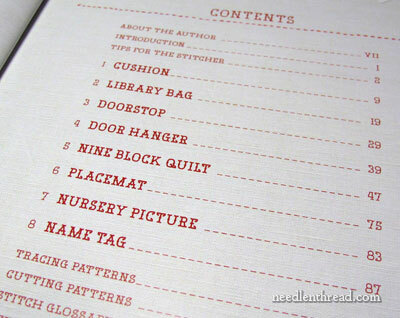 This is perfect timing, Mary, as I am currently taking the Redwork course through StitchMAP! This looks like a really cute book. Thanks for sharing the word…. I saw you were going to review this book yesterday. 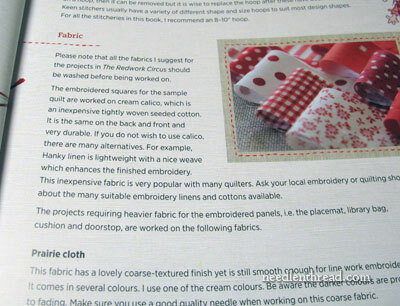 My Redwork Circus book arrived in the post later in the day, then last night there was the above book review!!! The book is every bit as I hoped it would be. I’m not actually a fan of red, but I thought these designs would be great on little baby things. The clowns are so loveable. Jenny McWhinney is such a talented artist, as well as designer, so it is great to see the watercolours throughout the book are all done by her. I am now itching to spend time with these little characters over the coming months. No, I don’t want this book. No, I don’t want this book. No, I don’t. Nope. Heh heh. You sound as if you’re trying to convince yourself, Mary Anne!! What you have is called “Coulrophobia” and I think it’s pretty common! I’m not a big fan of clown images, but they don’t creep me out as much as they do other people. I have my own phobia, which I can’t find a specific name for… it’s a fear of falling. I don’t mind flying in planes or being in tall skyscrapers as they are enclosed. I can’t stand standing near the edge of a roof, climbing tall ladders or any situation where it would be easy to fall (as a kid I had panic attacks and refused to dive in swim class – even though I was a good swimmer and I loved the water they held me back with the “minnows” little-kid group until I stopped going to camp at 12 or 14). It has improved a lot over the years. Bridges aren’t as bad for me as they used to be. My baby sister had (maybe still does – I’ll have to ask) a horrible fear of people in giant costumes like they have at Disneyland. We had a local market that had people wearing cow (and other animal) costumes and it was impossible to take her shopping! http://en.wikipedia.org/wiki/Coulrophobia and http://phobialist.com/ are both interesting sites. I’d really like to try Redwork at some point. Aside from the clowns (which, for clowns, are pretty cute), this book looks good! I like the snail, the dog and the bird on the head of one of the clowns (the photo is a bit sideways). The stars and the typefaces are really nice, too. I’ll have to see if there is a library around that has it (I know it’s not in my town’s library – I know their entire needlework section – but there is inter-library loans and my card works at the libraries in neighboring towns). Thank you for the review and sharing this side of yourself! Best Wishes! Yes I have it and bought it because they are the best little clowns. Antique type. Also I like that it is not just single line sewing but a bit more character to the pictures. Was never very patial to blackwork until I saw and Elizabethan garment done totally in blackwork. As to the books you have numbered as good reads etc. I totally agree great books for history and the changes down the ages. I usually say can’t have too many books. Oh yess you can and I love them all for a variety of reasons though. I dare say the woodworm reckons there can’t be too many. Once again Mary you have caught my attention. Mary like you I have an aversion to clowns. I have never been able to accept them as jolly, clumsy but delightful entertainment. I think it could be all that white face paint. Having seen Jenny’s clowns I am drawn to them. I do like the library bag clown. Rabbits out of hats a mean feat especially balancing on a pumpkin. As I have a grandson I see any combinations of these scenes as a bib front on overalls, even on other little pieces on the legs. Whether I ever do them is another matter. The little animals are all quite expressive and delightful. I do like tha pug as he does say ‘ here we go again’ and resigned to carry on. The dissapearing pug is a good example. The door hanger is a simple little project and would make a very pleasant stocking filler. The book is well laid out and even a beginner would able to make any of the projects. All in all I found this book a very good ‘how to book; with a delightful out come for anyone. Thanks for the review you expressed my thoughts to the dot. Mary, A recent illness has left me with doing nothing more strenuous to do than embroidery. (Poor, poor me — an excuse to use needle n’ thread.) For 3 weeks, I have been stitching by day and by night (in bed with an ipad) I have been reading the many years of your articles on and watching your tutorials! Thanks, thanks, thanks. 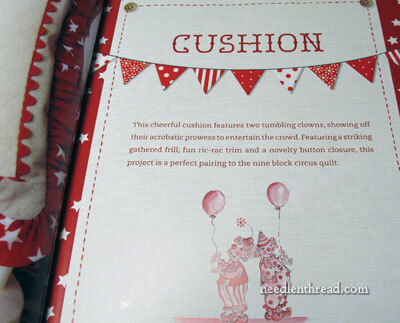 I read the book review on the Redwork Circus and felt exactly as you did — the cute little clowns are enchanting. 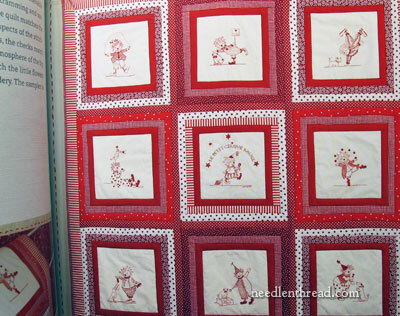 Just for the joy of stitching I will make the funny quilt and hope to make people smile. How would I have found this gem in Australia without Mary?? Awww Taffy, your comment has made my day! I’m sorry you’re in bed with an illness, but I’m happy to know that Needle ‘n Thread has kept you company and given you a project to look forward to! Enjoy working the quilt – I know it will be darling! Previous Previous post: William Morris Calendar – Give-Away Winners!